Tonight’s entrée and side dish both used freshly chopped cilantro; store fresh cilantro with cut ends in a jar of water and leaves loosely covered with a plastic bag for several days and change water every 2 days for best flavor. 1. Season chicken with salt and pepper. Heat oil in a large skillet over medium heat. Add chicken and cook for 3 minutes, stirring often, to brown. 2. Add mushrooms and cook, stirring often, for 2 minutes. Cover and let cook until mushrooms start to soften. 3. Add garlic, lemon zest and juice, spices, and spinach. Stir thoroughly. Cover with lid and cook until spinach starts to wilt. Stir well and check chicken for doneness; it should be cooked through. 4. Transfer chicken mixture to a large mixing bowl. Add scallions, sour cream, and 1 cup cheese, stirring to combine. Set aside. 5. Preheat oven to 375°F. Spray an 11×17-inch baking dish with nonstick cooking spray and set aside. 6. 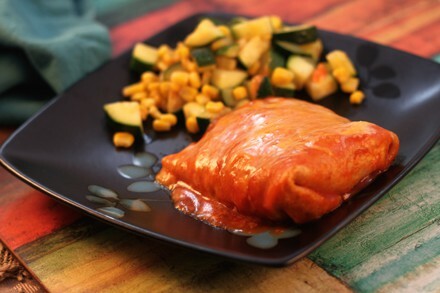 Pour enchilada sauce into a large skillet over medium-low heat. 7. When sauce is warm, dip both sides of a tortilla into sauce, allowing excess to drip off. Place tortilla against the short side of the baking dish and fill with chicken mixture. Roll tortilla around filling, tucking in edges and arranging it seam-side down. Repeat with remaining tortillas and filling. 8. Pour remaining warm sauce over enchiladas. Sprinkle with remaining cheese. Spray a large piece of foil with nonstick cooking spray and use it to cover baking dish with the sprayed side down to keep cheese from sticking to it. 9. Bake for 20 to 25 minutes or until the sauce is bubbling. Remove foil and cook 10 minutes more to lightly brown cheese. Remove from oven and serve immediately with olives and cilantro. Let cool completely. Move remaining 4 enchiladas to 8×8 foil baking dish. Cover with plastic wrap and freeze up to 3 months. Remove from freezer to defrost in refrigerator overnight. Preheat oven to 350°F. Remove freezer wrap and cover dish with aluminum foil. Bake for 20 minutes or until heated through. Serve with olives and cilantro. 1. Heat oil in a large nonstick skillet over medium-high heat. Add zucchini and corn; cook, stirring occasionally, 7 to 8 minutes or until zucchini is crisp-tender. 2. Remove from heat, and stir in cilantro and remaining ingredients.